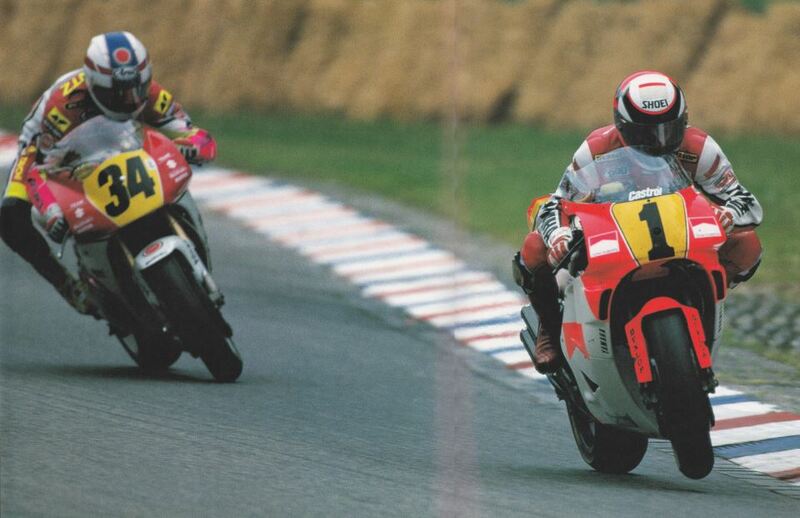 Wayne Rainey on the Yamaha YZR500 leads Kevin Schwantz on the Suzuki RGV500 on the last lap. Schwantz stayed behind Rainey through the first chicane, trying to build momentum for a draft pass. He managed it and took the lead from Rainey. It looked like Schwantz has made a tactical error, letting Rainey draft him on the last straight that leads into the stadium section. Rainey prepared for the right turn, but Schwantz swung out from behind and performs a spectacular late-braking pass - the RGV was squirming from side-to-side and the back tyre was hopping up and down leaving a dashed black line of rubber. Schwantz got it under control and made the turn, but Rainey wasn't giving up and tried to stay on Schwantz’s left as they headed to a left turn, but Schwantz had better drive coming out of the previous turn and got in front of Rainey and stayed there to the line.